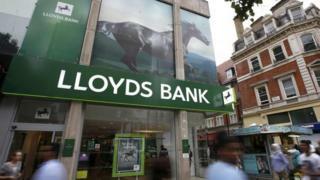 The government has abandoned plans to launch a major retail share offer of the 9% of Lloyds Bank it still owns. The chancellor said market volatility meant it was not sensible to attempt to sell the multi-billion pound stake it still owns to members of the public. The shares will now be sold via a "trading plan" - small tranches of shares sold to institutional investors. Philip Hammond said the private sale would ensure the taxpayer recovered the "full investment" made in the bank. He said that £17bn of the £20bn invested by the government, when it bailed out the bank during the financial crisis, had already been sold back to the market. "We need to recover the taxpayers' money," Mr Hammond said, saying that he wanted Lloyds to be fully back in the private sector. "The proceeds of the Lloyds bank sale - the priority is to turn those assets into cash and use those to reduce debt," Mr Hammond said. He said that the sale of the government's stake in the Royal Bank of Scotland was "not practical at the moment" whilst the bank was under the threat of fines from the Department of Justice in America and was struggling to sell its Williams and Glyn branch network.